With 10:56 remaining in an easy win over Creighton, North Carolina point guard Kendall Marshall drove right. As he rose for the layup, Creighton’s Ethan Wragge put a forearm into Marshall’s midsection. Marshall put out a hand to cushion the fall, but his right wrist buckled as it absorbed the full weight of his body. The result was a fractured scaphoid — a nightmare for Carolina. Marshall will have surgery to put a pin in the wrist, but he’s highly questionable for the rest of the tournament. Carolina advances to face Ohio on Friday night in St. Louis, but if you’re prone to extreme thinking, it’s awfully tempting to say that the Tar Heels’ title hopes are effectively over. At times this season, despite the wealth of talent on their roster, they’ve looked stationary and stagnant, and only Marshall’s incredible vision and passing ability could shake them from the malaise. Without his leadership, Carolina is a gun without bullets. Roy Williams cleared the media out of the locker room after the game so he could announce the news to his team. Marshall had been checked by the doctor, and when they realized the bone was broken, he began to cry. Then Carolina’s staff brought in Marshall’s parents, and they all cried together. But Marshall (who I can report from firsthand experience is even more impressive off the court than on) came back to the locker room with red eyes and conducted a brave interview with microphones and cameras and recorders in his face. He cracked jokes, spoke about the strength of his team, and gave his vote of confidence to backup point guard Stilman White. “When he’s in the game, we don’t lose much,” Marshall said. Only one exchange seemed to really get at the pain he was feeling. Q: What was your reaction when the doctor told you what it was, that it was a fracture? A: It hurt. It hurt. Like I said, first and foremost, I hurt for my team. Because I want to be there, to help them to the best of my ability. Once they told me, I took it a little hard. Told my parents, we took it a little hard. Even before Wragge’s hit on Marshall, Carolina fans were up in arms about Creighton’s physical play. In the first half, when Grant Gibbs slapped John Henson’s injured wrist, Henson got in his face and earned a technical foul. When the altercation was over, Gibbs winked at his teammates, which many fans took as a tacit admission that he’d intentionally gone after Henson’s weak spot. Whatever the case, Henson’s anger spurred the Heels to a huge run that put them ahead of Creighton for good. After the game, Bret Strelow of the Fayetteville Observer reported that P.J. Hairston nodded vigorously when another player was asked if the foul had been malicious, a simple signal that probably reflected the entire team’s outlook. A few minutes after the technical, Bluejays center Gregory Echenique waited for Tyler Zeller in the lane after Marshall launched a long 2. He threw both fists into Zeller’s chest, staggering the Carolina big man, and Zeller made the dirty hit look worse by flopping backward in his trademark dramatic fashion. Boos rained down on the court, and the bad blood was boiling. By the time Wragge laid the hit that broke Marshall’s wrist, the powder keg was ready to explode. Furious Carolina fans tweeted at Wragge en masse, using a variety of expletives and hate speech to curse him for potentially ruining their season. Many Duke fans, who had endured the merciless taunting of Carolina Nation two nights earlier after an embarrassing loss to Lehigh, celebrated the injury unabashedly, inflaming their powder-blue rivals and escalating the ugliness. The worst elements of Tobacco Road were on naked display. As far as anomalies go, Duke’s 2010 national title is looking like the quintessential example. Guys who had underperformed for their entire college careers (Brian Zoubek, Lance Thomas) began playing tough basketball at the perfect moment. A veteran guard corps that included Jon Scheyer, Nolan Smith, and Kyle Singler played beautifully for six straight games, emerging by turns with clutch shooting performances and defensive masterpieces. A down year in the NCAA paved the way for a reasonable draw, and gritty wins over Baylor in a virtual away game in the Elite Eight and Butler in the championship, along with an impressive Final Four performance against West Virginia, secured the title. But that year aside, Duke’s recent trajectory has felt decidedly negative. In 2005 and 2006, physical teams (Michigan State, LSU) exposed Duke’s weakness in Sweet 16 failures. Duke saw one of the most embarrassing losses in team history in the first round against Eric Maynor and VCU in 2007. Elite guard play and defensive pressure revealed Duke’s lack of athleticism in a second-round loss to West Virginia in 2008, and again in a Sweet 16 loss to Villanova in 2009. Then came the title. Last year’s heartbreaking loss to Arizona in the Sweet 16 can be chalked up to bad luck and confused chemistry, but this year’s loss to Lehigh was the most humiliating installment yet. Without 6-foot-11 Ryan Kelly, Duke simply could not play defense. Lehigh’s guards — especially C.J. McCollum, who ended up with 30 points, six rebounds, and six assists in a performance reminiscent of Maynor’s in 2007 — got to the foul line almost at will, and their big men were equally effective. In all, the Mountain Hawks managed an absurd 71.2 percent free throw rate, the third-highest single-game percentage the Blue Devils have allowed since 2003. Despite playing poorly, Duke somehow held a two-point lead at halftime. But the cruel truth facing the Blue Devils was that Lehigh was also playing poorly, a fact that Mountain Hawks coach Brett Reed made clear in a halftime interview. In his inimitable speech style, which Tom Robinson of the Virginian-Pilot describes as “the precision and lilt of a man reciting a book on tape or updating the traffic-jam report,” Reed expressed cautious optimism that even better things were in store in the second half. He was right. Urged on by the cheers of the North Carolina fans who had stuck around after their team’s easy first-round win against Vermont, Lehigh thoroughly outclassed the Blue Devils. Midway through the second half, coach Mike Krzyzewski wore the expression of a man who had given up, which wasn’t surprising considering his evaluation of his team as “very limited” in a halftime interview. The game remained close, but Duke’s only real chance to win was by hitting 3s, and they ended up with a dismal 6-for-26 mark from deep. McCollum and Gabe Knutson combined for 13 points in the last two and a half minutes, and it was over. In Chapel Hill on St. Patrick’s Day, Carolina fans were wearing T-shirts that said “Lehigh Beat Duke 75-70, and I was there.” Meanwhile, in Durham, the Duke faithful were left with the same questions that have plagued them for a decade. Coach K’s tactical and motivational ability are as sharp as ever, as evidenced by the success of a team that wasn’t very good this year, but his recruiting has become complacent. The school is a factory for elite guards, but it’s been almost a decade since a truly talented big man played at Duke, and there have been far more disappointments at every position — the Plumlees and Andre Dawkins are just the latest examples of players whose (very) occasional brilliance can’t disguise their long-term failure — than success stories. When compared with North Carolina, the talent disparity this season, and indeed since Roy Williams took over in Chapel Hill, has been shocking. Worst of all, Duke teams have shown a disastrous tendency to peak in January and February while the truly elite clubs are at their best in March. It’s already clear that with or without Rivers, next year’s team will be a long way from a title. Without a spark from somewhere, Duke’s long denouement will continue. At this point, there aren’t enough superlatives in the world to describe the job coach Mark Gottfried has done in his first year at NC State. He inherited talent, but he also inherited a legacy of losing, complete with disheartened players and fans who had lost their self-belief after the trials of the Sidney Lowe era. In a single season, he’s turned it all around, and with Sunday’s 66-63 win over Georgetown, he’s taken them back to the Sweet 16 for the first time since 2005. It was a classic triumph for the Wolfpack, who trailed 15-8 at the 10-minute mark and 25-15 with five minutes remaining in the first half. In a way, the game was a microcosm for the entire season. While they probed the difficult Georgetown defense, looking for openings and dealing with their own nerves, it was hard not to think about the insecurities and uncertainties State has had to overcome since November. Finally, just when it seemed hopeless, the Wolfpack cracked the defense, doubled their point total in the last five minutes, took a lead into the half, and played inspired basketball to beat one of the toughest teams in the country. Four players finished in double figures — C.J. Leslie with his incredible interior quickness, Scott Wood with his timely 3s, Leslie Lorenzo Brown with his epic baseline rainbow, C.J. Williams with his stoic persistence — and the long-suffering Richard Howell contributed nine while playing a brilliant defensive game on Georgetown’s Henry Sims. You get the feeling that while Duke and North Carolina implode beneath their mutual bitterness and bad luck and failure, something special is happening in Raleigh. 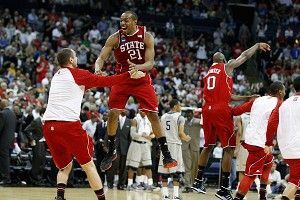 The Wolfpack will face Kansas in the next round Friday night, and are a win away from a possible rematch with Carolina. But what I’ll take away from this season, more than anything, is Gottfried’s goose-bump-inducing pregame speech. As the team mobbed him in the middle of the locker room, you could hear a single shout: “Together on three!” And that, apparently, is how you resurrect something dead.